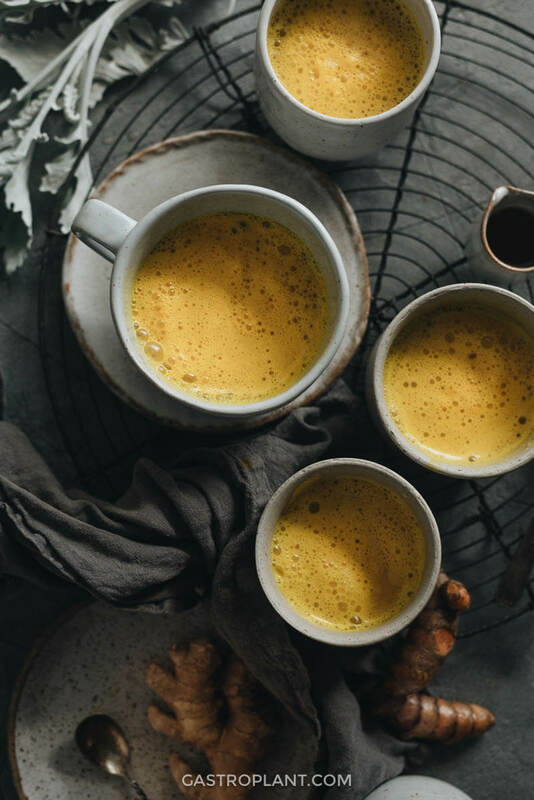 This vegan turmeric latte, with its bright and fresh flavors, is invigorating and refreshing. 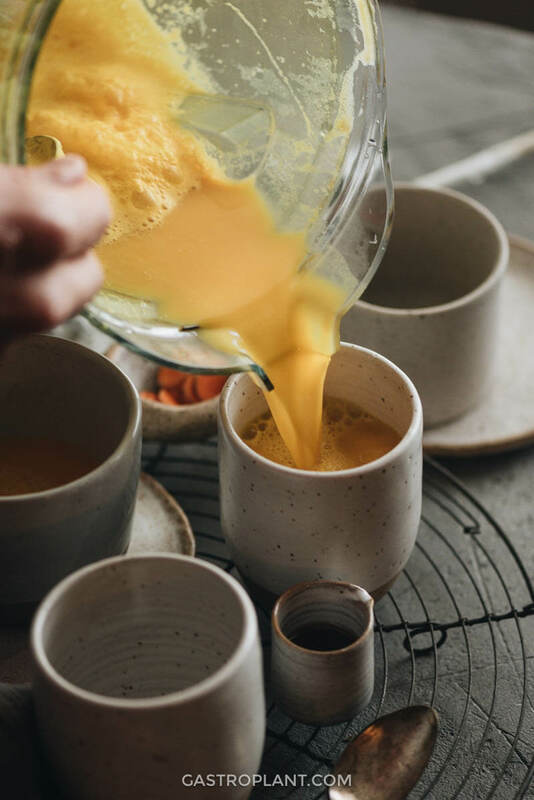 Containing just turmeric, ginger, plant milk, and a touch of maple, it’s extremely simple to make. You can drink it any time of day, hot or cold, and it’s sure to be delicious and comforting. I wanted to develop this recipe after an experience I had dining at an Indian restaurant in New York recently. The place had a pretty decent plant-based menu and made us a really flavorful and filling dinner. After dinner, it can be nice to drink something hot. I usually go for decaf coffee, being a slow metabolizer of caffeine, but they had an intriguing-sounding turmeric latte. I’d never tried one before, so I asked if they could make it using plant milk. To my surprise, they weren’t able to make a plant-based version. I’m probably spoiled by the fact that so many places, coffee places especially, offer alternatives to dairy milk. 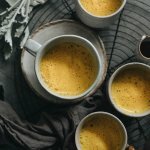 In any case, I still wanted to try a turmeric latte, so a few days later, I bought some fresh turmeric root, ginger, and almond milk and started experimenting. I tried different ratios of turmeric to ginger to milk, different levels of sweetness, I even tried powdered spices to see how it compared. I got turmeric stains on my hands, cutting board, blender bowl, and even my laptop. And it was totally worth it in the end, though. The final result was creamy, aromatic, and satisfying, with a bright golden color. While I made this drink hot, it can be drunk cold as well. Because the blending process itself creates some heat, you may need to chill the drink if you want it to be cold. 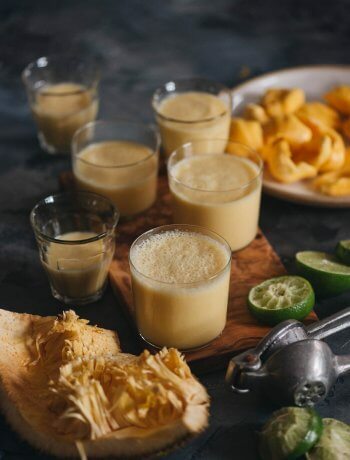 If you don’t have access to fresh turmeric and ginger, it’s possible to use powdered versions of those spices and still make a drink that tastes alright. But I highly recommend using fresh spices if you can. It will make a world of difference to the flavor and aroma of the drink. Be careful with the turmeric because it can easily create stains that are difficult (if not impossible) to remove from plastic, wood, and cloth. Turmeric stains on the hands can last a full day, so handle it carefully or wear gloves. I recommend cutting the turmeric root on a cutting board that you’re not concerned about getting a little stained and don’t leave the cut root on the board for long after you’ve cut it. If your blender has a plastic bowl, take care to only blend the drink long enough to make the texture smooth. Leaving the drink too long in a plastic blender bowl will also stain it. If your blender bowl is made of clear glass, you don’t need to worry about it getting stained. You can use any plant milk you like. I tried it both with vanilla and unflavored, and both were good. If you used sweetened plant milk, you may need less maple syrup (the recipe assumes the milk is unsweetened). This drink pairs beautifully with my Vegan Curry Tofu Scramble for breakfast. Pour the plant milk into a microwave-safe glass or bowl. Microwave on high for 1 1/2 - 2 minutes until steaming but not boiling. Combine the plant milk, turmeric, ginger, and maple syrup in a high-speed blender. Blend on high for 2-3 minutes until the texture is smooth. Pour into glasses or glazed mugs and serve immediately. 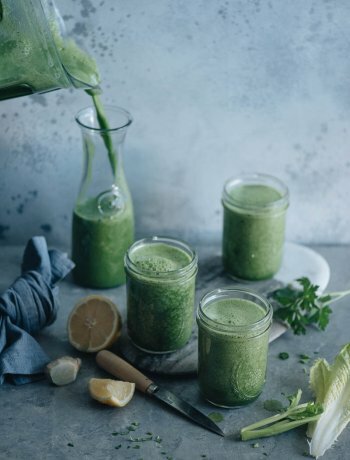 Combine the plant milk, turmeric, ginger, and maple syrup in a high-speed blender. Blend on high for 2-3 minutes until the texture is smooth. Pour into glasses immediately. Chill drink in refrigerator as needed. You should wash your cooking surfaces (cutting board, blender bowl) immediately after removing the turmeric from it, to prevent staining. Be careful not to get the turmeric root or the finished drink on your clothes. You can also use sweetened plant milk. In this case, you may need less maple syrup than prescribed. 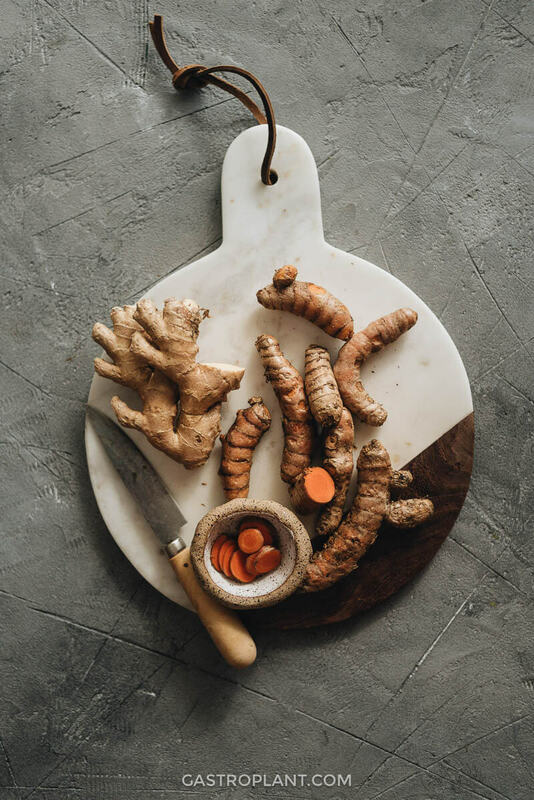 Though I absolutely recommend using fresh turmeric and ginger if you can acquire them, you can use 2 teaspoons of turmeric powder and 1/4 teaspoon of ginger powder as replacements.